Friday evening’s airstrikes by U.S., U.K. and French forces lasted just over an hour, but could yield consequences that echo down the years, both domestically and abroad. Following reports of a chemical attack allegedly ordered by Syrian president Bashar al-Assad against Syrian civilians in the Damascus suburb of Douma, the three powers cooperatively engaged in a military response, launching missiles into the beleaguered nation that targeted facilities involved in the manufacture and use of chemical weapons. The exercise proved successful, despite claims that 70 percent of incoming missiles were destroyed. Even if those claims are true, the success of the mission cemented the U.S.’s confidence in its ability to intervene in the Syrian conflict. Where problems begin to creep up is what that confidence could come to represent and how it interacts with future calls for military intervention. Anti-American sentiment is nothing new to Syria. 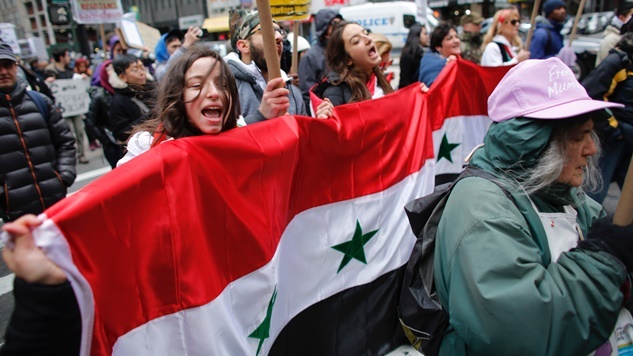 The presence of U.S. troops within the country as the gruesome years-long civil war unfolds has allowed al-Assad and state forces to further cultivate those sentiments. Trump continues to press for those troops to return home as ISIS-held territory has been retaken, though that decision has been criticized as it could lead to renewed ISIS expansion within the region. The airstrikes give al-Assad more rhetorical ammunition to spread that sentiment among those in the nation who maintain loyalty to the president, as evidenced by the rash of public demonstrations by Syrian civilians decrying the trio’s acts. Beyond rhetoric, the U.S.’s action could impact Russia’s desire to build a strong military response. Russia’s inability to prevent the airstrikes from succeeding, along with the failure of Russian mercenaries to overwhelm U.S. forces in February, have left the Kremlin stewing while continuing to color the U.S. as a pushover. The airstrikes were an exceptional failure, considering Trump gave them a week’s notice of the attack via tweet and the U.S. contacted Russian forces on the night of the attack to tell them to not get in the way. Putin, and therefore Russia, does not enjoy any implication of inferiority, and while the U.S.’s recent successes against Russian forces are easy to brag about, those losses could fuel a spirit of vengeance within Moscow. The nation has already shown it can influence American leadership and political process. The airstrikes could also establish new benchmarks in what actions incur American military intervention, both in terms of the nature of the response and what triggers it. Assad’s continued use of conventional weapons within Syria hadn’t inspired intervention, but last week’s chemical attacks, along with the images of its victims, spurred the coalition into action, at least for one night. While it is unknown if the airstrikes were a one-time action, the threshold for military response has now been set. Setting such a benchmark for intervention could present a dangerous precedent, especially when the circumstances around the motivations of the attack prove somewhat questionable. Responsibility for the chemical attacks in Douma has been attributed to either Syrian rebels or al-Assad, depending on the source, but U.S. intelligence agencies and U.S. ambassador to the United Nations Nikki Haley were not able to provide the results of its analysis of the chemical agents used in Douma prior to the airstrikes. French president Emmanuel Macron stated that at least chlorine was used in the attack, but that is the only agent formally confirmed by any of the three nations. U.S. officials think sarin was another component of the attack, but no confirmation of that belief was rendered before Trump approved the response. Even more troubling than unconfirmed evidence, the president’s decision could have been influenced by his daughter, Ivanka, a White House official with no apparent job definition and no diplomatic experience. The Organization for the Prohibition of Chemical Weapons has yet to divulge the results of its investigation in Douma, but the influences around the president could prove unhealthy as the weight of future responses is evaluated. That’s concerning beyond what appears to be an isolated act in Syria as nuclear tensions between the U.S. and North Korea, and the U.S. and Iran, continue to heat up.